I am not a big shopper. I used to be, but not anymore. The idea of browsing just doesn't entice me the way it used to, so if I end up in a store, it's because I need something. And let's face it, unless it's the grocery store, I rarely need. However, my kids seem to need things all the time. So last week, I was at the craft store, passed by the dollar bins and knew I had a banner in my future. These sweet green paper flowers and tags just screamed spring and summer to me, so I picked them up ~ using my 40% off coupons of course ~ took them home and got busy. It's been a pretty rainy and dark season here so far, so they brighten up my kitchen and since they're paper, I can't possibly kill them. ...instand paper flower banner...or paper flower garland. I never know which word people prefer. 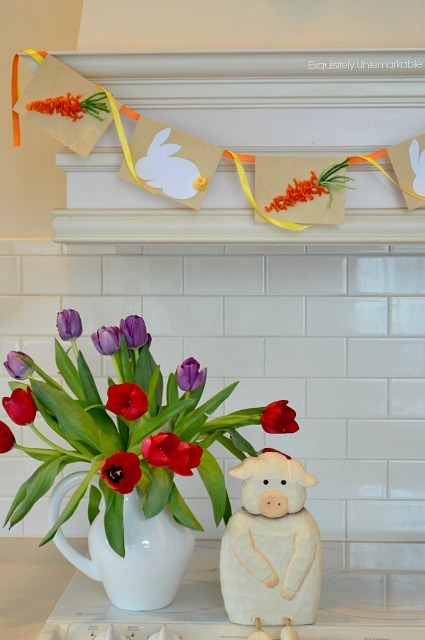 I just know that the flowers add a bit of fresh spring and summer color to my kitchen and my pig really seems to like them. And for less than two bucks, so do I. How about you? Are you a paper flower banner fan? I make other banners, too. I am kind of a banner junkie. You can peek at the whole collection by checking out the Banner tab in my menu...and here are a few of my favorites. I was just thinking of how I need a banner for my side porch. I have to go looking for pieces to put together. Thanks for the inspiration! I bet you have a ton of things that would make a great banner in your stash, AnnMarie!! This is so pretty, fresh and spring/summer Kim. Love it! Have a nice weekend. Perfect word, Celestina Marie, fresh is exactly what I was going for! What's in a name right, Jann? 😉Thanks for the sweet words! Love all your banners and this new one is soo soo cute. 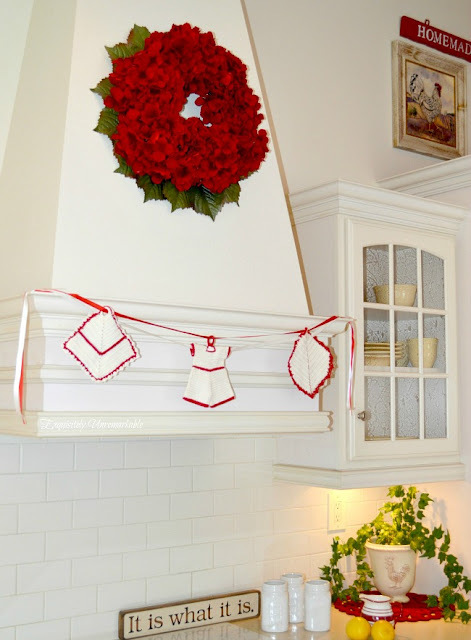 My fave is the vintage potholder banner. Too cute. I haven't seen those flowers in the stores before. Very pretty. Nice job. Oh, clothes shopping is my nemesis. Although, recently I have discovered Dress Barn and I actually enjoy shopping there. I should share some finds. That's cute Kim, and so are all your other banners! I love 'em all! This is really cute. The only banner I've made was my Scotty Dog banner at Christmas. I used plaid paper and my cookie cutter and made the dogs double sided with different plaids, and twine. Banners are my favorite, Deanna. Yours sounds super sweet! Your banners are so creative and fun! Another fun idea. Thank You for sharing. 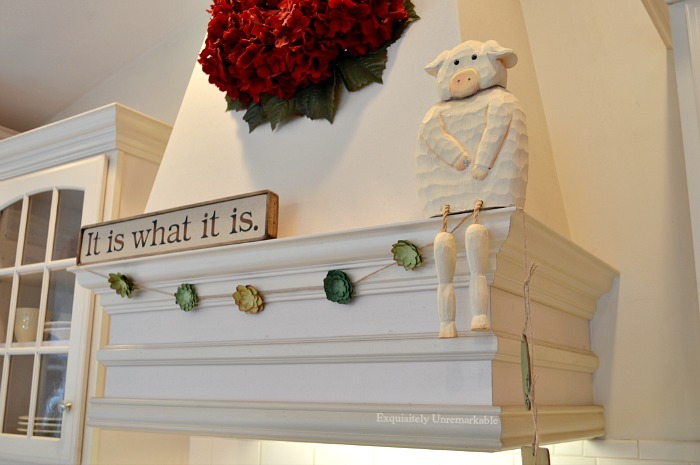 Cutest garland ever! Hope you have a wonderful week! Well, we all know you are the "Queen of Banners," so it should be no surprise that when those paper flowers and tags caught your eye, you were immediately thinking "BANNER!" It's really cute, Kim. 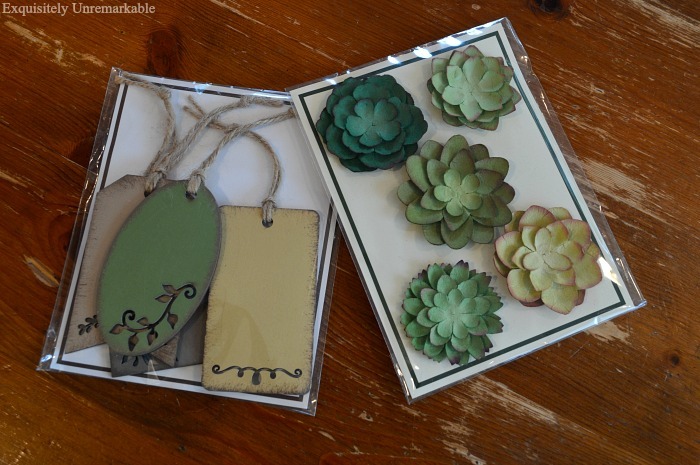 They kind of look a bit like succulents to me, but I've had succulents on the brain lately. Hey Kim what a cute idea for a banner! 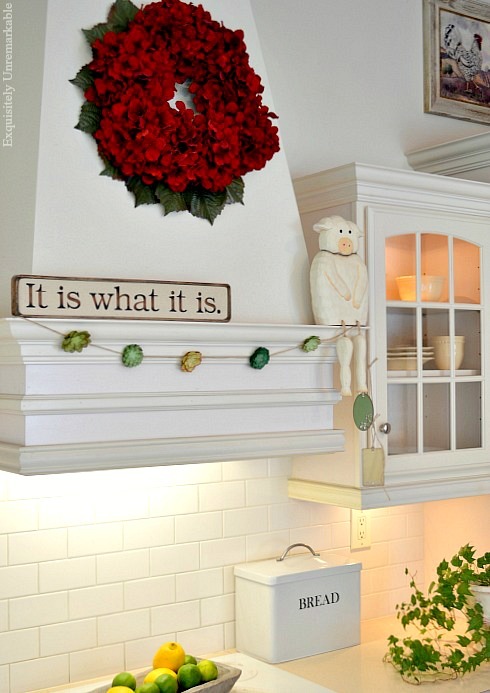 That was really creative of you and it looks nice in your kitchen. Thank you Julie! 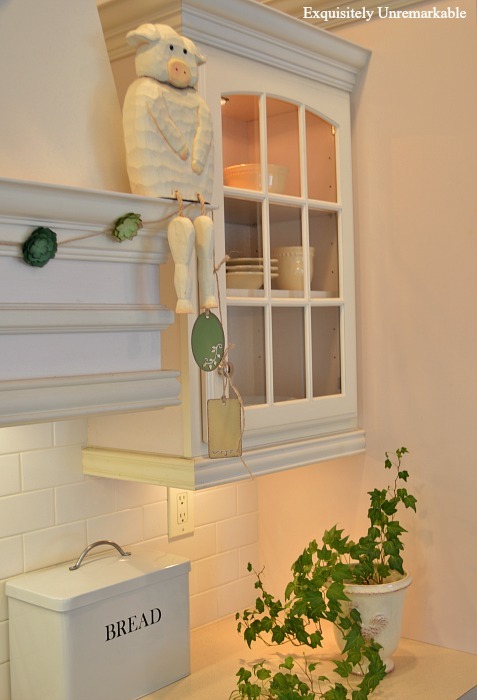 It was super simple and it brightens the space for sure. I love the clean simplicity of it. Just what you want for summer decorations. Oh I LOVE your paper flower garland--they put me in mind of paper succulents! I have not seen these at my dollar store, but I'll be watching! I grabbed them at Michael's...with a coupon for sure!